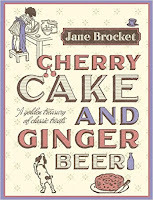 Cherry Cake and Ginger Beer by Jane Brocket. 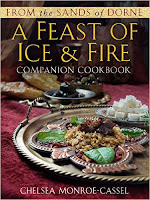 I love the combination of memoir and cookbook that Cara has created. Even without the recipes it would be an entertaining read. With the recipes it is even better. After reading the Hansel and Gretel section all I wanted to do was go home to make myself some gingerbread while reading Grimm’s Hansel and Gretel. This book is so much fun and would add a little zing to any book club meeting. Reading Gone with the Wind? Mix up a pitcher of “Gone with the wine”. Every drink in this cocktail guide is inspired by literature. My favorite part of this book is the humorous explanations before each recipe. 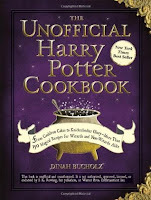 The Unofficial Harry Potter Cookbook : from cauldron cakes to knickerbocker glory--more than 150 magical recipes for wizards and non-wizards alike by Dinah Bucholz. 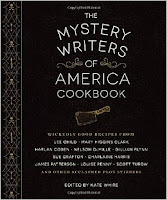 The Mystery Writers of America Cookbook edited by Kate White.